Luang Prabang, Laos: A Slice of Heaven? "Happiness only multiplies, never decreases, when it is shared,” the young monk paused and smiled at me as I absorbed his words. I was sitting at a picnic table under a large banyan tree outside a wat in Luang Prabang, Laos. I came here on a tip from a local resident who encouraged me to seek out the monks for a philosophical discussion. Luang Prabang is a small, ancient city tucked away in northern Laos at the junction of the picturesque Mekong and Nam Khan rivers where nature and community converge in an unassuming way. Longboats run the rivers, rice fields line the banks, mountains paint the distant landscape, and the slow pace of life will envelop even the most harried traveler. This is the perfect place to while away the hours relaxing on the quay with a good book or simply get lost exploring the town. Pick any side street and you’ll be treated to unexpected delights that reward present awareness - a beautiful garden, a breathtaking river view, the ancient stones of a temple, the handmade artistry of a silversmith. The residents treat visitors with the same respect they show to each other, making it easy to feel comfortable and at home. The day starts early with bells tolling from the wats before long rows of clean-shaven monks in saffron robes walk the narrow streets to collect alms from the local people. As I watched this ancient ceremony unfold, I was intrigued by their calm bearing and unassuming presence and wanted to meet them. Bolstered by the encouragement of a local shopkeeper, I cautiously entered a wat compound where several monks were busy with various chores. I sought out two of their younger members and asked if they spoke English. They looked at each other, giggled, and flashed a pair of warm smiles before pointing me in the direction of the banyan tree where a trio of monks was studying. As I approached, my shyness quickly dissipated when I noticed they were reading aloud from a well-worn “Nancy Drew and the Hardy Boys” book. He looked up at me with an honest, open face and his smile instantly reassured me. Also see: Phi Phi Islands, near Phuket, Thailand. I quickly saw how that selfless attitude was ingrained in the culture of Luang Prabang. The strong sense of community trumps any money-making scheme. Stop in a café and you’ll quickly make a friend or two. 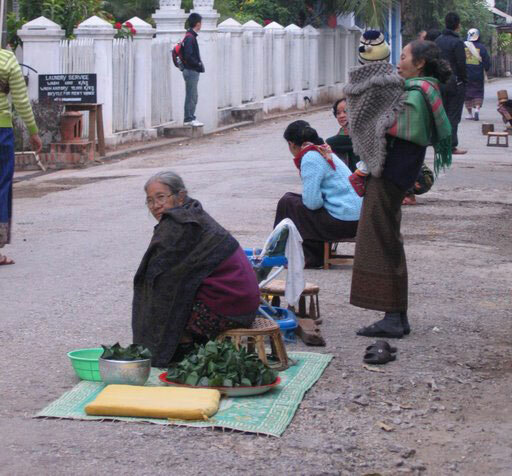 Street vendors don’t call out for tourists to buy their wares or to take a ride in their tuk-tuk. The locals help each other in unassuming, kind ways no matter the chore or need. The schools and shops close at mid-day as family and friends gather for their afternoon respite, and the tantalizing scent of homemade stir-fries lazily wafts through the street corridors,mixing with the banter of easy conversation. 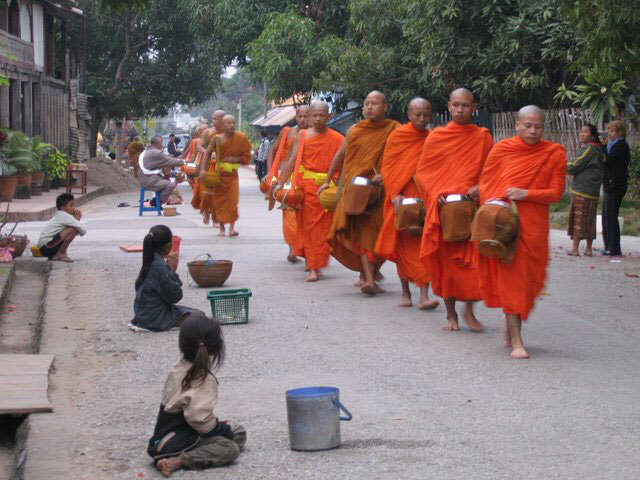 Children give offerings of food to the monks in Luang Prabang. When the sun dips behind the mountains, the lanterns of the night market light up like so many fireflies, and all sorts of impressive silver jewelry, silk textiles and handmade crafts are put on display. You won’t hear any aggressive selling tactics by the vendors though; you only sense their pride as you admire their work. As I explored the place, time escaped me and all worries slipped my mind. This small town in one of the world’s economically poor countries is rich in compassion and community. The elements of Buddhism are played out in every facet of the people’s lives here. It sure seems to work here. Every aspect of Luang Prabang is at peace with itself. When to Go: High season for Laos tourism is November through March and the month of August. 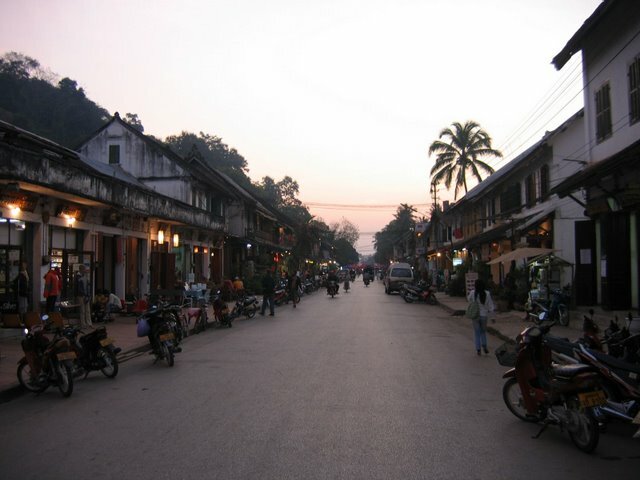 While daytimes are temperate, nights can get chilly in Luang Prabang between November to February so be sure to bring a light jacket or sweatshirt. Getting there: A popular 2-day slow Mekong River boat ride departs from Huay Xai, Thailand (near the Thai Border) most mornings and includes an overnight stay at the rustic Luang Say eco-lodge (Luangsay Mekong River Cruises) from US$295 pp). Where to Stay: There are several guesthouses and inns to choose from that will accommodate every budget. A tour of several of the other inns and guesthouses in Luang Prabang left me convinced that the Lotus Villa Laos offers the best all-around experience, and I thoroughly enjoyed my stay there. The comfortable and clean guesthouse is located on a quiet street just a few blocks from the river and the center of town. They have a very friendly, well trained staff, and include breakfast and free bottled water in the tab. Free Internet available in the lobby. Bonus: Lotus Villa sits on the monks’ alms route. Simply step out the front door in the early morning to observe the time-honored tradition. The kip is the official Lao currency. However, with the current exchange rate (8,500 kip to the US dollar in June 2009), the largest unit of currency equates to just over US $2. For larger transactions, you’ll want to use widely-accepted US dollars or Thai bhat. Credit cards are not widely accepted. There are several ATMs in town that dispense kip. You can also exchange cash (no credit card transactions) for kip at the airport. Visiting the Wats: There are a few customs to consider when visiting the temples or wats. First, always remove your shoes upon entering the building. There will usually be a sign, but in general, take them off before mounting the last flight of stairs. Monks are not permitted to touch women, so female travelers should never try to shake hands with or pass something directly to a monk. The feet are considered the lowliest part of the body, so take care not to point your feet at any Buddha images. Finally, dress modestly on your wat visits. Short shorts or skirts will cause stares and possibly offense. Night Market: Sisavangvong Road, the main thoroughfare through town, closes to car traffic every evening for the night market that begins at sunset. Be warned that it closes down around 9PM. Other Experiences: Allow 3-4 days to absorb the tranquility of Luang Prabang and then enjoy a day trip to the Pak Ou Caves, multi-sport adventures along the Mekong River, a swim in theTad Se Waterfall, and hikes to overnight homestays in authentic Hmong mountain villages. 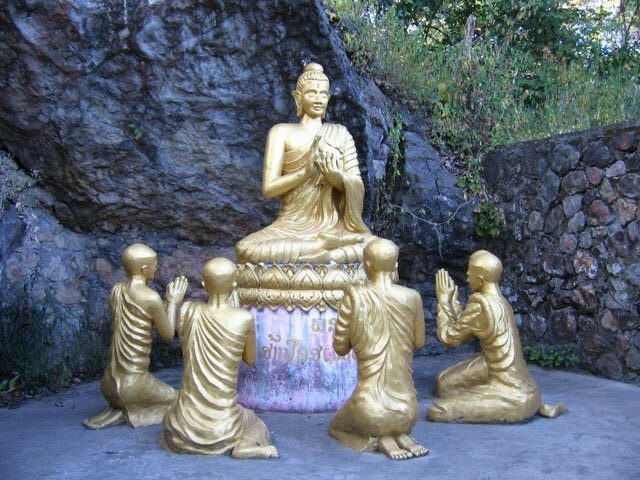 All of these excursions can be arranged by the many tour operators that line Sisavangvong Road. I recommend All Lao Travel Service (13/7 Sisavangvong Road; Tel: 856-71-253522 ) and Green Discovery Laos (Unit 44/3, Sisavangvong Rd; Tel: 856-71-212093 ). Paige Stringer is a travel writer who covers adventure and volunteer travel. She invites you to view more of her work and read her blog at www.paigestringer.com.